TWO body cameras have captured the moment police shot a 72-year-old man after he allegedly came at them wielding knives during a disturbance in Woodridge. Police were called to the Station Rd home shortly before noon after relatives of the man, believed to be a Vietnam veteran, reported a mental health disturbance. Police arrived to support paramedics after the relative called an ambulance for help. 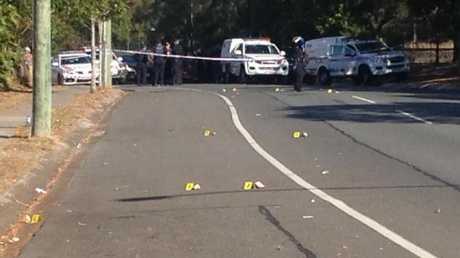 Inspector Jim Plowman said the man had been throwing rocks at police and paramedics before arming himself with knives. "A police officer discharged his firearm once ... and it caused a gunshot wound to the right shoulder of the 72-year-old male," he said. "It's an unfortunate incident for all concerned. "The officer certainly didn't come to work today intending to shoot anybody but it is always an occupational hazard and sometimes, although we try to take every action to avoid such things, sometimes there are no other options." The officer who fired the shot was believed to be an experienced sergeant and firearms trainer. The incident was captured on the body-worn cameras of two of his colleagues. The injured man was last night in a critical condition at the Princess Alexandra Hospital. "We are working on the assumption and the belief that there were some mental health issues involved," Insp Plowman said. 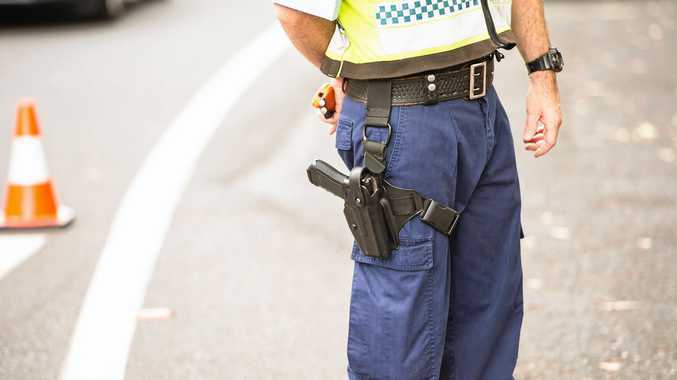 "All I know is that we had Queensland Ambulance staff on site and Queensland police officers (and) he presented with weapons and the officer had no option other than to discharge his firearm." 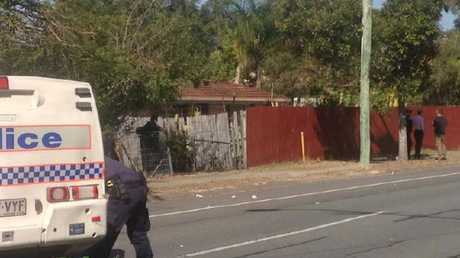 Nearby residents told The Courier-Mail they had not heard the disturbance - or the gunshot. A section of the road was yesterday cordoned off by police and large rocks could be seen scattered over the bitumen. Forensic officers and Ethical Standards Command detectives were called in to investigate. Queensland Police Union general secretary Mick Barnes said the police on scene were forced to respond when they were put in serious danger. "We're here to look after the police officers who have defended themselves, but also defended the other family members and the members of the QAS," he said. "We just wish him a speedy recovery."